Hurrah! The Faverolles and assorted bantams have arrived! The next 21 days will see them gently rotating at 100F in a third grade classroom at a local school. I heard that the children are very excited, but then again, so am I! Here they are getting settled in their new home. There are 12 Faverolles eggs that will be the start of my breeding flock. The American Livestock Breeds Conservancy lists this breed as “threatened” and we hope to help in our small way. I purchased the bantams because I thought the kids would get a kick out of the tiny eggs and chicks. It was hatchery’s choice and they chose: 6 Quail Belgian Bearded D’Anvers, 2 Porcelain Belgian Bearded D’Uccles, 2 Golden Sebrights, and 2 Silver Sebrights. We’ll keep you updated with what hatches. 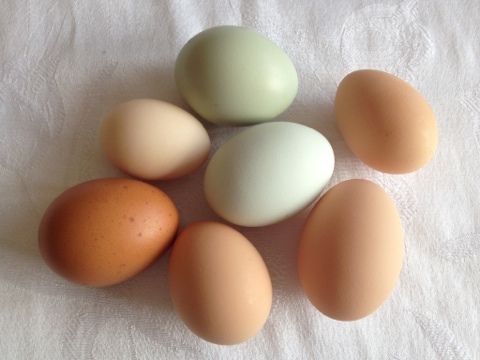 If you want to see the story behind the eggs, visit our Letters to Chickens post. Congratulations, my dear girls, for you are going to be big sisters! You must feel so grown up. The fertile hatching eggs of our newest flock members arrived in the mail yesterday. They were snuggly wrapped in paper towels and expertly cushioned for the journey. My lovely chickens, do you remember being shipped as day-old chicks? I remember your arrival. You were curious and pecking at every new thing, much like you do now. Let me tell you about your new sisters and brothers. The twelve Faverolles eggs came as promised as did a hatchery selection of twelve bantams: 6 Quail Belgian Bearded D’Anvers, 2 Porcelain Belgian Bearded D’Uccles, 2 Golden Sebrights, and 2 Silver Sebrights. I admit I had a momentary twang of disappointment. These were not the breeds I was hoping for! Where were the Silkies with their funny feather poofs? The Barnvelders with eggs the color of dark chocolate? Why did I have to get these birds out of all the possible breeds that the hatchery carried? Mommy was sad because she had read that the pretty Sebrights can be standoffish and flighty; Quail D’Anvers sweet, but plain. Does this mean I’m a bad mommy? Then I thought that perhaps this was a cosmic lesson in acceptance and love. I pushed that disappointment away and made a promise: I am your mommy and I will love you no matter what. Daddy was a little distressed by the twenty-four new eggs now that they have arrived. He said that was a lot of chickens. I think he is concerned that mommy won’t have the courage to chop off their heads and eat them. Gosh, I guess when I write it like that it does seem a little drastic. No wonder daddy is uneasy, but I promise to be brave and follow through in my decision to participate in the rooster culling necessary to a small heritage flock. My darling girls, I know you are curious to meet our new family members. They will be home with us soon enough. I delivered your new sisters and brothers to that nice teacher and his class this morning. They will incubate them for 21 days and welcome them with love and affection into this world. I hope the children enjoy learning about chickens and farming and the miracles that are you. I hope they feel special because they are contributing to the American Livestock Breeds Conservancy’s mission to rescue beautiful breeds from extinction. I find helping is a dualistic action: Simultaneously altruistic and selfish. That feeling that you receive more than you give. Mommy is very grateful to you, dear chickens, for all that you give in exchange for simple grain and grass.